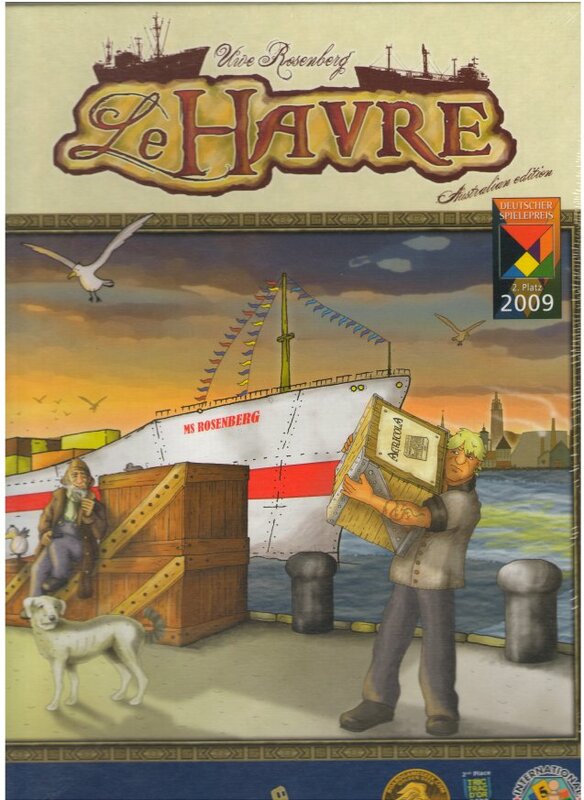 In Le Havre, a playerâ€™s turn consists of two parts: First, distribute newly supplied goods onto the offer spaces; then take an action. As an action, players may choose either to take all goods of one type from an offer space or to use one of the available buildings. Building actions allow players to upgrade goods, sell them or use them to build their own buildings and ships. Buildings are both an investment opportunity and a revenue stream, as players must pay an entry fee to use buildings that they do not own. Ships, on the other hand, are primarily used to provide the food that is needed to feed the workers. After every seven turns, the round ends: playersâ€™ cattle and grain may multiply through a Harvest, and players must feed their workers. After a fixed number of rounds, each player may carry out one final action, and then the game ends. Players add the value of their buildings and ships to their cash reserves. The player who has amassed the largest fortune is the winner. Other products in the "Le Havre" series. I like this game, it is very playable from 1 to 5. and every game I have played so far has been different. easy to learn. and has that eruo game feel to it. One of my favorite games for 2 to 4 people, lots of choices and decisions. Gameplay is very satisfying. Better implemented than Agricola. This excellent economic engine game by Uwe Rosenberg comes follows in series to Agricola, one of the top-rated board game of all time, and builds on the complexity and entertainment of its predecessor. It's a truly great game, most enjoyable for three or four players though scalable between one and five. Its only downfall is sheer length of play (I tend to prefer shorter games) with 2.5 to 4 hours being a reasonable expectation. Very in depth use of a few of the agricola mechanisms. Like Agricola, it has replayability through the random use of only using a few cards of the many each game, which could change the game in many ways. Some Caylus aspects but in its own right, a different use of that same aspect. I like to joke that this game is just like Monopoly, you earn money by building and owning, most money wins. Now take Monopoly, remove the dice, add three more boards, 100 more properties, and a shipping line and you're close to Le Havre. What a great game!